You love the Venice crime fiction from Donna Leon? I do. Not only do her books carefully compose clues, stresses, red herrings, and police procedure (plus Italian and Venetian culture and cuisine), but the interactions among the characters -- especially Commissario Guido Brunetti and his family -- deepen the books and their impact. I often pre-order my copies of each new title. That said, there's generally just one new Donna Leon per year. So to get an extra dash of Venice, one may indulge in less skilled authors who still have a good mystery to offer. 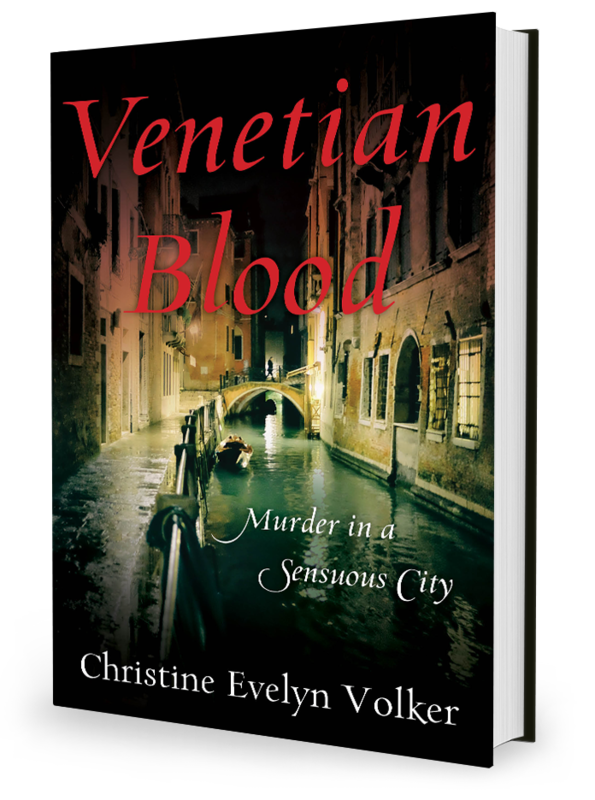 And that's the case for Christine Evelyn Volker, whose VENETIAN BLOOD is released in August from She Writes Press. Volker's mystery shows the signs of an early-career author, especially in the first few chapters. But it gets better, and I enjoyed the final twists, which involve financial dirty dealings and affaires of the heart and body. Plus, the book helped meet that Venice appetite. But don't count on cuisine, or depth of relationships -- Volker's catalyst for relationships tends to be romantic attraction, versus the lines of faith, loyalty, and compassion that Leon lays out so strongly. Also, for a collector, there are some questions about books from She Writes Press, which occupies the murky middle ground between standard publishers and what used to be called vanity presses. The press president, Brooke Warner, is a regular writer for Huffington Post; see her explanation there, of her press's new arrangement, where established authors mentor new ones, included in the fee. 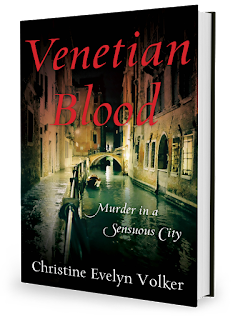 In the case of VENETIAN BLOOD were Nina Schuyler and David Corbett. Yes, that's enough to make me sit up and notice. So should you collect this and/or, more pertinently, pick up a copy to read? My opinion: Yes, if you specifically collect Italian crime fiction. No, if you're going to measure the book against Donna Leon and others at the top of the field. Hope that's enough to help you make a decision. I ended up pleased with the book's plot by the end, but it was rough to get to the middle. One of the heady pleasures of international crime fiction is exploring a culture from the inside -- including the lingering effects, often dark, of a region's history. 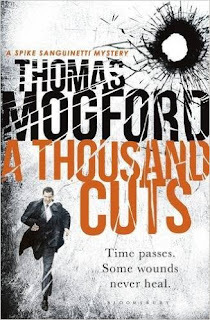 So the newest crime novel from British author Thomas Mogford, A THOUSAND CUTS, fascinated me with its setting: Gibraltar, that rocky headland off Spain's southern coast. Not only is the "Rock" a sentry location for the Mediterranean: It provides the remains of a 14th-century Moorish castle and the 18th century Great Siege Tunnels, which were expanded in World War II. We readers realize from Chapter 1's placement in 1940 that a deadly wartime explosion at Gibraltar's shipyard could be more complicated than the investigators would realize. But we're swiftly back in the present time with lawyer Spike Sanguinetti (this is the fifth in his series), abruptly taking on a new client. Is the angry and booze-addicted old man just a typical confused remnant from Gibraltar's underclasses, former sailors and soldiers who collapsed in place and never left? Or is there a more pointed reason that this client has harassed a wealthy resident? Spike Sanguinetti is a fascinating character, not least for his sympathy for his mostly unlikeable new client. He's tangled in the case in more directions than he at first realizes -- understandable that he's a bit distracted, since he and his financée are expecting a baby very soon, their adopted child is having "issues," and the close friends on Gibraltar who usually support him have a stake in seeing the client's past hushed up, and the series of crimes on the headland closed quickly. From the tunnels to the action to the emotions, not to mention the wartime suspicions that emerge during Spike's efforts, this book is a classic page-turner, rich with atmosphere and urgent with action and risk. It's my first read in the series and I found gaps in understanding some of the terrain, so given the option, I'd explore the earlier books first, before reaching this one. But even as a cold read, stepping onto Gilbraltar in Mogford's series, it's a marvelous addition to the summer reading stack -- recommended, for sure! 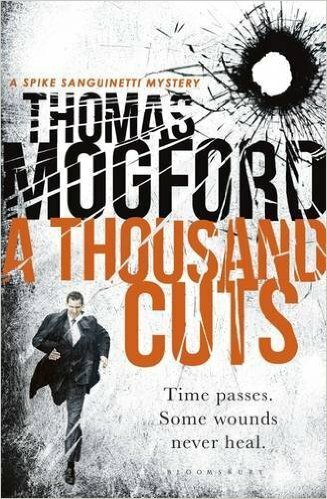 (Note that Mogford is getting great critical attention in Britain, where he made a CWA short list for the debut of this series.) Glad that Bloomsbury brought the book across the Atlantic, released this week in the US. Today's the release day for ARROWOOD, a debut crime novel from Mick Finlay. The publisher (Mira) captured the book's premise in this tag line: "London Society takes its problems to Sherlock Holmes. Everyone else goes to Arrowood." It's a great way to enter the Holmes world without trying to craft yet another pastiche. Consider William Arrowood a rough character himself, a former newspaper man whose scorn for the chronicled super-deductive high-society sleuth peppers his conversations -- and determines his attitude toward people in his South London slum who seek his help. If they reveal they wish they could afford Holmes instead, they're in trouble! The very moment I walked in that morning I could see the guvnor was in one of his tempers. His face was livid, his eyes puffy, his hair, least what remained on that scarred knuckle of a head, stuck out over one ear and lay flat with grease on the other side. He was an ugly sight, all right. I lingered by the door in case he threw his kettle at me again. Even from there I could smell the overnight stink of gin on his foul breath. "Sherlock blooming Holmes!" he bellowed, slamming his fist down on the side-table. "Everywhere I look they're talking about that charlatan!" When a young French lady in a bonnet and billowing skirt arrives to see Arrowood's help, it takes all of Barnett's skill to keep her case attractive to his "guvnor." She risks losing the sleuth by her admiration for Holmes, of course, and also be being French ... and female. But Barnett has the bottom line in mind, and negotiates a case. 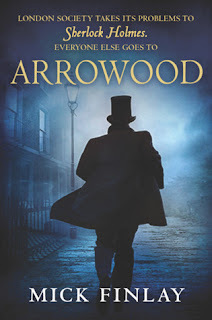 When it becomes obvious that Arrowood and Barnett will have to spy on and probably confront members of a dangerous criminal gang that's already threatened their lives, the crime novel turns into a Victorian thriller, hot with action and risk. The book's well written, with just a hint of "debut" novel in its pacing. Most appealing is actually the character of Arrowood's sidekick Barnett (a more emotionally complicated person than Doyle's Dr. Watson). Details of gritty and sometimes grotesque Victorian poverty come through, along with a finely honed edge of violence. Holmes fanatics are safe in picking up ARROWOOD because it steers neatly around the established sleuth's famous cases, keeping the focus in this down-and-dirty world instead. The feel is very similar to the series by M.R.C. Kasasian, and I enjoyed the dark humor. Well done, Mick Finlay!